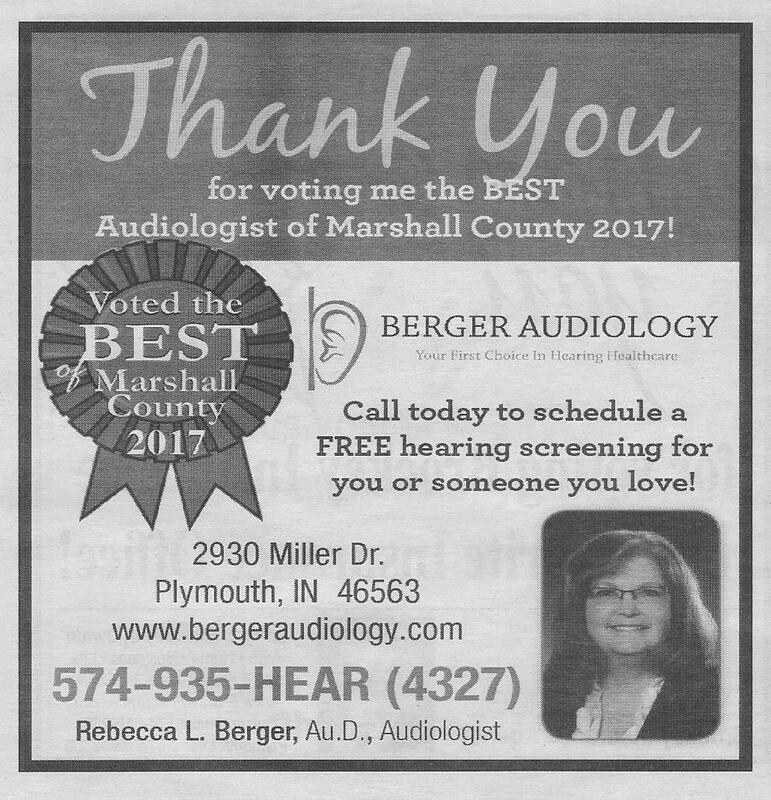 Becky participated in the The Pilot News “Best Of Marshall County” and was voted best Audiologist! Pretty cool! Not every place that hang s a shingle and sells hearing aids can boast that they have an Audiologist though. It takes extra dedication to obtain a Doctorate, but Becky has always been dedicated to her patients. 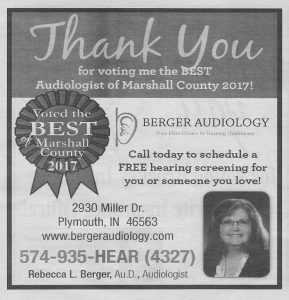 Her decision to open her own office, Berger Audiology, was largely due to her feeling that Marshall County was underserved. Before going out on her own, she was only here one day a week, despite lobbying her former employer for more time here. She feels good about devoting the time here and her ability to have control of her schedule. She’s also been able to obtain the latest technology which allows her to better serve her clients. Jonathan Leist, Culver Town Manager, asked me to help him in a forum presentation on Community Collaboration at the Indiana Municipal Management Association (IMMA) annual meeting at Swan Lake Resort on Thursday. Kevin Overmyer was to be the original speaker in my position, but he had to attend the Bill signing in Indy that day and backed out. As Jonathan said, Kevins are interchangeable. 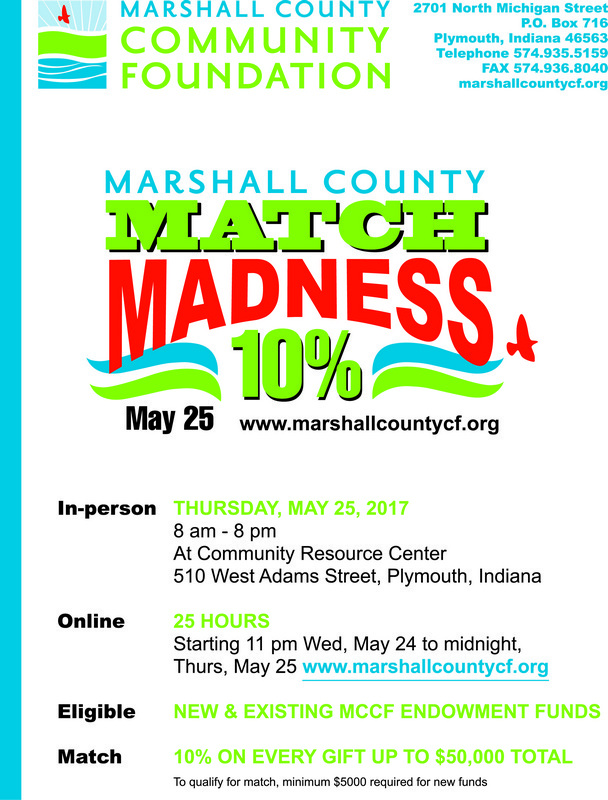 He also asked Chuck Kitchell, Interim CSC Superintendent, to participate to help discuss the shared programs between the town and the school. Jonathan wanted me to give history of the County Development for the Future program since it was an example of community collaboration on a larger scale. He asked me to give examples of collaboration that came from the program and talk about how it had morphed to meet needs over the years. I thought a synopsis of that discussion might be interesting to others here, so here you go! 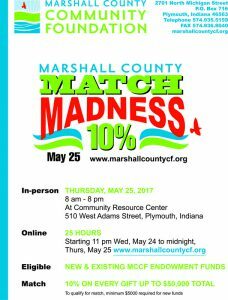 For those interested, this is a great way to make your donation dollars go just a little bit farther! Unless you have worked at Easterday Construction, you probably don’t know what the Pony Barn is… The offices of Easterday Construction are on what used to be Russell L. Easterday’s farm. We’re still technically at the west edge of Culver, but there used to be a bit more of a development gap! When I was growing up, my great grandparents lived in the brick house on the northwest corner of Ohio & Cass Streets with nothing blocking their view of the lumberyard site. The Pony Barn is the only remaining structure from when the property was a working farm. Some of the other buildings have been built on the foundations of former farm buildings and there is still the vague remains of a cattle barn in the woods at the back of the property, but that structure has mostly collapsed and rotted away. My great grandfather continued to do some cattle farming as a side venture, but he moved his farm up to northeast corner of School Street and Hwy 10. 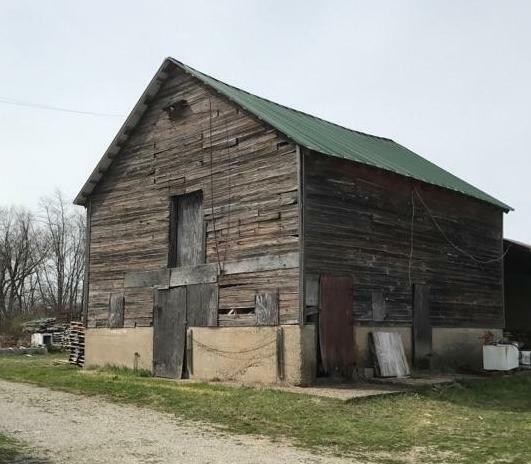 The barn that stood on that site has been gone for years, but I can vaguely remember that before the high school was built, Great Grandpa Easterday’s Herford cattle grazed on that property at the end of Slate Street. 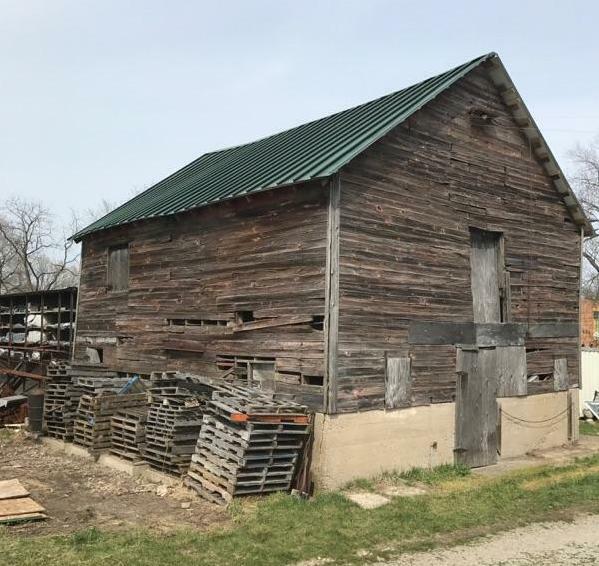 The Pony Barn has remained as a viable structure for shade and shelter over the years, though it’s been more of a home to wildlife in the past few years. We store some miscellaneous shingles, pipe fittings and forming materials in it. The interior has the original framing and you can see the stalls with the nawed boards from when farm animals were housed there. There are the remains of nearly petrified straw and hay in the corners, but they are so old that even the mice aren’t interested in them. The original tin roof has had some damaged patched here and there over the years, but this past winter’s wind storms did a real number on it. Patching was no longer an option. Fortunately, we had enough left over VSR roofing to reroof the entire building. And what do you know? It was Easterday Green! I have no idea how old it is. It has to be one of the older structures in Culver. It still needs some work, as many of the siding boards are failing. I intend to do some additional minor patching to keep the structure “alive”, for the memories if nothing else. It remains an interesting reminder of times gone by and of my great grandfather.